From the times when dinosaurs walked the earth and Aerosmith, Metallica, Van Halen, Scorpions and others bands were new and fresh bands on the metal scene, the Americans in Dokken were on their way. They stood just outside the main ramp candles, but was one of the largest and most potent groups which were on an expedited basis. The winds turned and the smaller groups ended up in the archives. The archaeologists on Frontiers have unearthed many of the bands from the heydays and have given these groups a new spark in the dark. 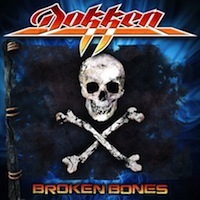 Dokken recent album is from 2008 'Lightning Strikes Again'. Now it's time for their new album 'Broken Bones'! Don Dokken on vocals is still a giant power vocalist, but in 2012 he has a more mature and subdued voice and not as high pitched as he had on the 80th records. Together with the brilliant guitarist Jon Levin, who delivers some imaginative and captivating guitar solos, Mick Brown, who handles the drum sticks and Mr Sean McNabb on the bass - Dokken delivers us their best album on decades. 'Broken Bones' is not one of my absolute favourite albums this fall, but it's a step forward in their development in comparison with their previous discs. You'll find a strong heavy metal track 'Empire' immediately in the first track with splendid tempo and sprightly energy. The title track is not one of the best songs and it's a mystery that they named the album after this sleeping pill. 'Best of Me' is a far better song with heaviness and it swings really heavy. The melancholic track 'Blind' has awesome guitar parts from Jon Levin, who lifts several of the tracks on "Broken Bones" by himself. Don Dokken must tie this guy down, so he doesn't leave him for a bigger rock band. From 'Waterfall' and 'Victim of the Crime' through the list down to 'Fade Away' are smoother, mature, shinier and nicely trimmed tracks, more in the melodic rock and AOR genre. The closing song 'Tonight' is one of the best tunes.